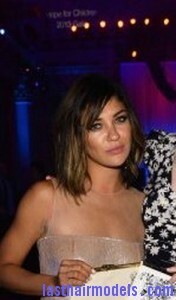 Jessica Szohr is having a lob haircut that is a longer version of the bob hairstyle. It is a medium length hairstyle that usually extends till your shoulders and longer hair can be folded under or secured at the back of your head. This style is a perfect choice for those who want to keep their hair short and it can be easily achieved with a feathered technique. Use this simple technique to achieve this hairstyle easily at home. To create this hairstyle, get suggestions from a hairstylist to achieve a dramatic and voluminous look. Then wash your hair with a regular shampoo and condition it as usual. Dry the hair using a towel and spritz a little amount of detangling hairspray. Add a little amount of gel in your fingers to apply it all over the hair. Next blow dry your hair using a paddle brush that can help to curve the hair towards your face during the drying process. Try to part the hair down in the middle to make two equal parts and make sure to keep it horizontally. Secure each of the section with hair elastic and pull a section of hair to fold it underneath. Use bobby pins to keep your hair at the end against the head and then continue the pinning process using two inch wide pieces of hair. At last mist all over your hair with firm-hold hair spray to get into the look.